swepro C630CL - for industrial use, eg lubrication of truck axles by the long spout. 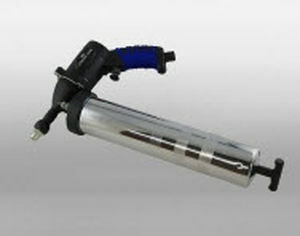 The swepro grease guns have a handy and weight-reduced composite housing and a chrome receiving shaft. Pressing the shutter button, the lubricant is an operating pressure of 6.2 bar pressed for the duration of release of the recording, and transported through the nozzle tube to the desired location. The chrome catridge can be fitted with grease cartridges or by a direct filling.